Examples are, for example, sound wave in air for longitudinal waves and the motion of a guitar-string if you play the guitar for transverse waves. For both kinds of waves amplitude is the maximum displacement of a wave from the equilibrium and wavelength is the shortest length between two points of the wave which are in the same wave-phase. The frequency shows the number of wave cycles in a second. 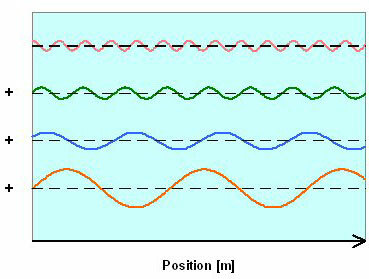 It is easy to calculate the speed of a wave from these data: wave speed equals the product of frequency and wavelength. 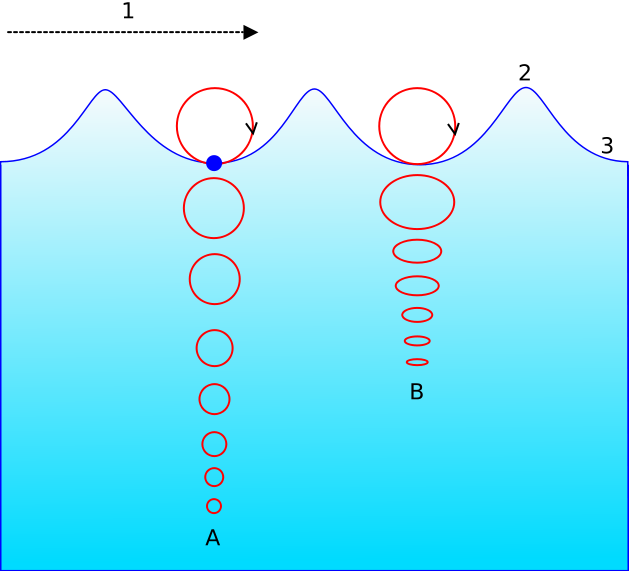 At point A, where the water is deeper, the path is circle, at point B, where the water is shallow, the path of the motion becomes elliptic with decreasing water depth. The arrow #1 shows the direction of propagation. #2 shows the crest of the wave, #3 shows the wave trough. The source of the image is the homepage of Kettering University. A Czech scientist, Jozef Gerstner obtained the first exact solution describing water waves of arbitrary amplitudes in 1802. 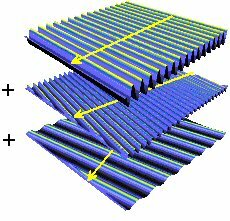 His model also describes the cycloidal movement of the surface waves. In this model the water depth is large compared to the wave length. The resulted curve is also called trachoid. where X0 is the undisturbed surface point, A is the wave amplitude, k is the wave vector and k0 is the magnitude. 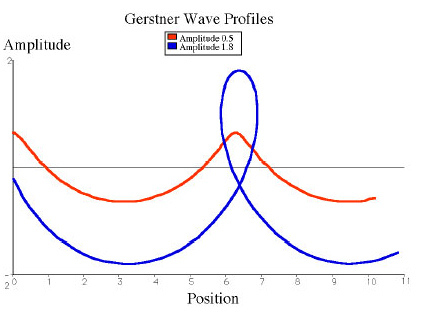 These qualities allow Gerstner waves to describe various surface waves under different conditions. For more details, see  or . Gravity: Fg = ρG, where ρ is the density and G is the gravitational force (9.81 m/s2). Pressure forces: These forces act inwards and normal to the water surface. Viscose forces: These are forces due to friction in the water and acts in all directions on all elements of the water. is the Laplacian in the space variables. For more details, see ,  or read about an implemented version: .